Dads walking hand in hand with their children. 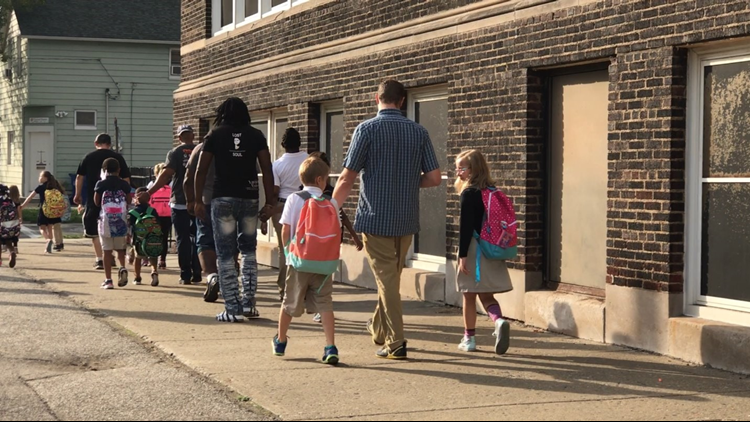 That’s a scene that will play out all across Northeast Ohio during Thursday’s Fathers Walk, a day when fathers of elementary school children are encouraged to walk their little ones into school. Participation for this annual school event has taken a giant step forward in recent years, organizers say. “This year, we’ve already registered 152 schools,” said Al Grimes, director of the Cuyahoga County Fatherhood Initiative. Dozens of Cleveland public schools will offer special activities and refreshments for fathers on Thursday. One school that reliably draws a huge crowd is Campus International School near downtown Cleveland, where more than 250 dads typically line the block for the Fathers Walk processional. At many schools, dads will read aloud a pledge card provided by the Fatherhood Initiative, promising to be involved in their child’s school for the rest of the year and to encourage their child to do their best. “We’ve gotten requests for over 15,000 pledge cards and stickers,” said Grimes. The event is coordinated by the Healthy Fathering Collaborative, the Cuyahoga County Fatherhood Initiative and the FAME Fathers program is Summit County. These agencies coordinate Fathers Walk activities at a number of schools across our viewing region. Learn more at neofathering.net. And watch WKYC on Thursday for coverage of the Fathers Walk.